An American Tail and The Land Before Time belong to the scores which marked James Horner's career. 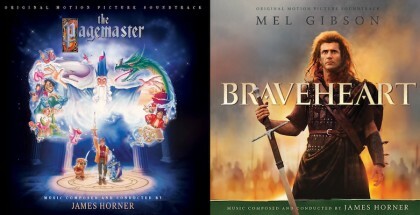 The authors of these two animated films (Don Bluth, the director and Gary Goldman, the producer) together discuss the creation process of these two incredible scores. 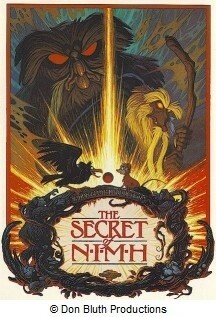 On The Secret Of NIMH (1982), you had collaborated with Jerry Goldsmith. Why did you choose James Horner to score your following films, An American Tail and The Land Before Time? Gary Goldman: Back in 1982, Jerry and I had become good friends over the fifteen-week schedule while he wrote the score for The Secret of NIMH. 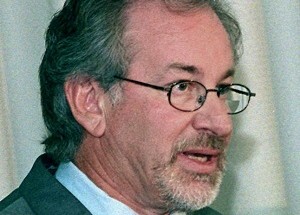 It was Jerry, who encouraged Steven Spielberg to see The Secret Of NIMH. Steven called us to borrow our studio copy of the film. His reaction was extraordinary. After he screened it for himself, Kathleen Kennedy and Frank Marshall, he asked us to come to his offices at Warner Bros. At that meeting he commented, "I thought this style of animation had died with Walt Disney in the '60s." 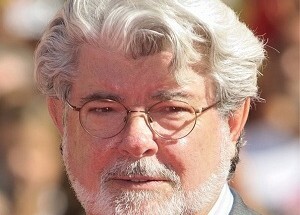 His enthusiasm for the film's story, animation and soundtrack caused him to invite us to collaborate on an animated film. Almost exactly two years later, in December of 1984, Steven called to let us know that he thought he had found a good property for us to produce. Then when we were developing An American Tail, early in 1985, we agreed that we would use Jerry Goldsmith as its musical composer. We even had a meeting with Steven and Jerry at Steven's new Amblin offices, on the Universal backlot. About two weeks after that meeting, Jerry called a second meeting. A meeting to apologize for accepting the assignment. At that meeting he revealed that he had spoken to his agent, who informed him that his composing schedule for the 1986 release was too full to accommodate writing the score for An American Tail. After Jerry left the meeting, we immediately began talking about James Horner's work and agreed that we should approach him. 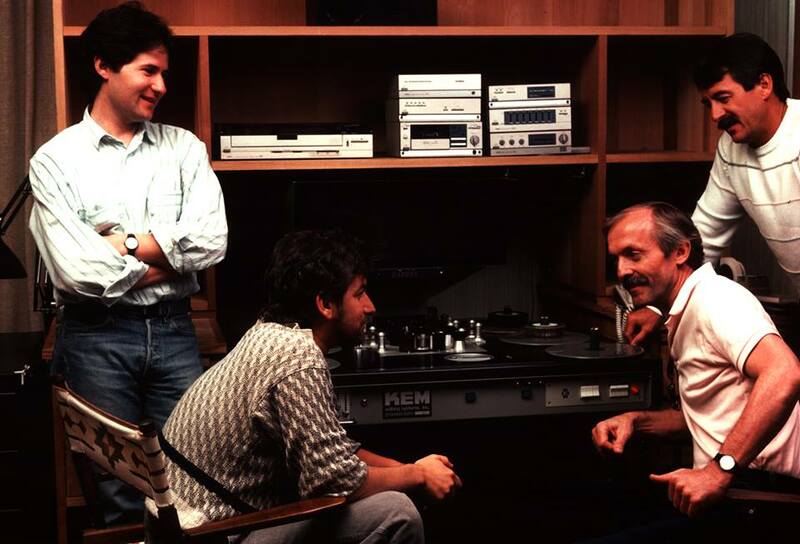 Strange, but back in 1981, right after we had commissioned Jerry to do The Secret Of NIMH, James' agent, Michael Gorfaine, called us and asked if we would accept a tape of James Horner's sample music to consider him to do the score for our film. I told him that we had already contracted Jerry Goldsmith. The agent countered with, "Jamie is the next Jerry Goldsmith, and a lot more economical." He sent the tape over to our studio and we listened to it. The Mr. Gorfaine was right. 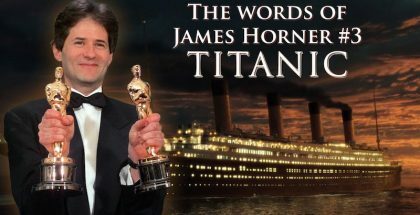 James Horner is extremely talented. However, we had sealed the deal with Jerry. James' scores on both An American Tail and The Land Before Time are unique works of art. And, after the release of An American Tail, Jerry called me often, apologizing for not accommodating us on Tail. He told me that the projects that he had committed to were nowhere near as creative as An American Tail. What instructions did you give to James Horner to express immigration and diversity of cultures in An American Tail? Don Bluth: When we "spotted" music for the picture in Steven's editing room, we talked about instruments and themes for each of the main characters. I usually select temporary tracking music (from LP records of various film scores). 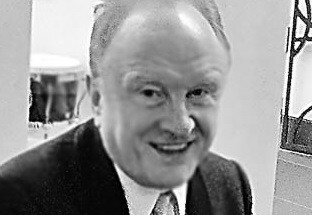 Many of the selections were from his own film scores, and from the work of John Williams, Jerry Goldsmith, Ennio Morricone, Korngold and others. I would also verbalize what feeling we were seeking for each sequence in the film. I'm sure he knew what to do without my input, but that is the reason for music 'spotting' sessions. It is to allow a collaboration and for the composer to hear what the producers and director have in mind as the story unfolds. 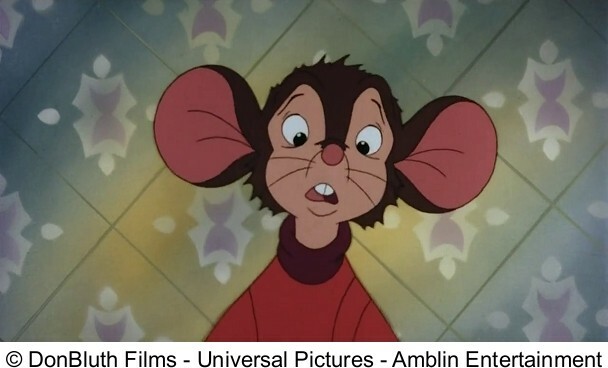 In how much time was An American Tail composed? Gary Goldman: I believe James had fifteen weeks to write the score for An American Tail. Plus, he had time early in the production to collaborate on the songs with Barry Mann and Cynthia Weil. We needed the songs recorded early in the film’s production in order to animate the characters to the lyrics and the beat of those songs. 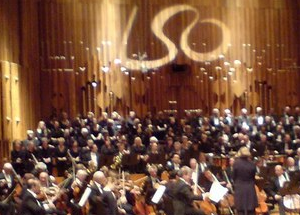 Whose choice was it to record in London with the LSO? Gary Goldman: It was James. He had great experience with them and with Abbey Road Studios. 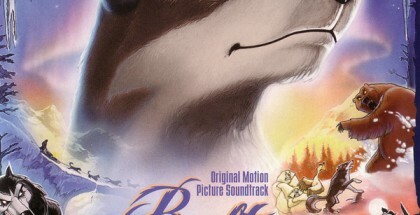 James Horner chose to use a violin solo to represent Fievel's father and a soft choir to depict Little Foot's sadness after the loss of his mother. Could you tell us how these two musical ideas were developed? 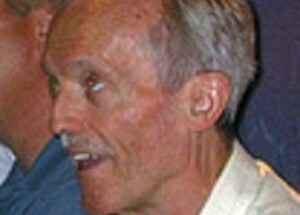 Don Bluth: James is very sensitive, creative and intuitive. As we ran the workprint of the film with dialogue and temp music, some questions would arise. The idea of writing character themes with which to identify each character and perhaps which instrument might best describe the personality of each character is not new to composing for film. It is even more prevalent in animated films. I have some background in music, so I think James and I were speaking the same language. Those elements were developed and agreed to during the spotting sessions. Of course, once James went to his own music room, it blossomed into what became a beautiful score. In what terms did you ask James Horner to musically evoke the fact that the characters regain trust thanks to friendship and to brotherhood? Don Bluth: I assume you are referring to The Land Before Time. I try not to go overboard in describing the feelings intended. I'm hoping that what we've put on the screen evokes the feelings (along with the temp music I've selected), but some philosophical discussion does take place, and as we agreed, the music cue must support and/or reinforce the point of the scene. We feel the same about our use of color. The story is the most important and the music is also telling the many moods of the story. James understands this and, I would say, he needs little or no direction. Regarding the songs in An American Tail : can you tell us about the creation process of them? Don Bluth: For the songs, Amblin brought in Barry Mann & Cynthia Weil, a songwriting duo whom had a long list of hit songs. We had to choose and agree where songs would be appropriate to entertain as well as not stop the story. The discussions we had drove the point that the lyrics must move the story forward or help describe the characters’ personalities. Cynthia and Barry would work together with James to write: There Are No Cats in America, Never Say Never, Somewhere Out There and A Duo. Barry and James came up with the melody and Cynthia scribed the lyrics. The first time we met, we discussed the sections of the script where we would insert songs. Each song situation was different, Somewhere Out There was to show that Fievel and his sister Tanya loved and missed one another. Unbeknownst to them, they were both in the same city but did not know where the other was. 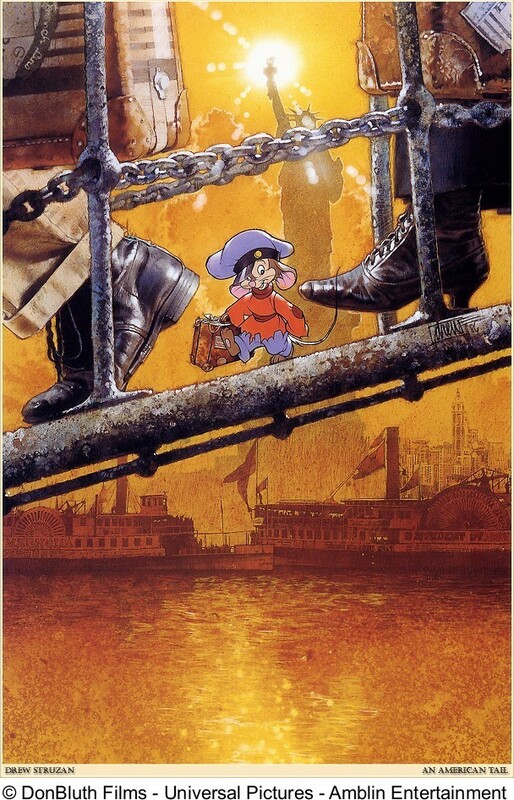 Never Say Never was for a moment between Henri, the French pigeon, who finds little Fievel on Ellis Island, where the erection of the Statue of Liberty is taking place, and where Fievel has landed in America. He had been separated from his family. He is sad and feels he'll never find them. Henri raises Fievel's spirits with this Never-Say-Never song. There Are No Cats In America was to reinforce the belief that there were no cats in the new world. The Cats in Russia were a symbol of the oppression they endured in Mother Russia. The song was about their hope for freedom from oppression. The song would be sung by many of the migrant mice expressing the experiences that troubled them but that their futures were bright in America without cats!. Similar discussions applied to "A Duo" when Fievel and the not-so-fierce cat, Tiger, meet and discover they have many 'likes' and 'dislikes' in common. By the end of the song they become buddies. After a few weeks, we met again with the songwriters. This time James, Cynthia and Barry were there to perform Somewhere Out There and There Are No Cats in America. The songs weren't polished. It was just an audition of the songs, a performance with James playing the piano and Cynthia, James and Barry singing. There were no negative comments on either song. Actually, Somewhere Out There received immediate accolades from all of us – we all loved the song. There were even comments from Steven that he thought the song could hit the pop charts. The Land Before Time is among the most appreciated soundtrack by the visitors of our site and is often considered as a great symphony inspired by big names of the romantic genre (Prokofiev, Bartok to name a few). What are your very thoughts about this score? Gary Goldman: The names of those great composers are all very familiar to James and he can definitely weave a magical music wand over a blank music score sheet. 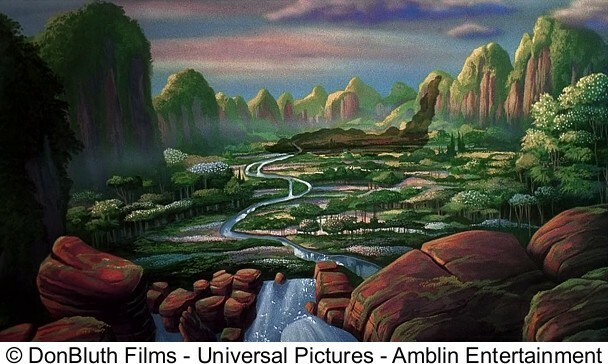 The score for The Land Before Time paints the film's emotional moments beautifully. We couldn't be prouder. Actually, when I think about recording that score, I remember that James was so tired after finishing, I think, Cocoon. 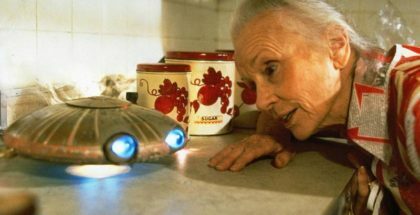 He had something like five film scores to write that year (1988), and the Cocoon (The Return) score went into extra time, shortening The Land Before Time score's writing schedule from 12 weeks to just 5 weeks. Plus we were recording in London at Abbey Road Studios. So, besides the shortened schedule, he had to deal with jet-lag. It was amazing that he was able to put all of this together in such a short time. How is that humanly possible to write such a huge symphony (90 minutes of music I guess this was?) in such a short time? 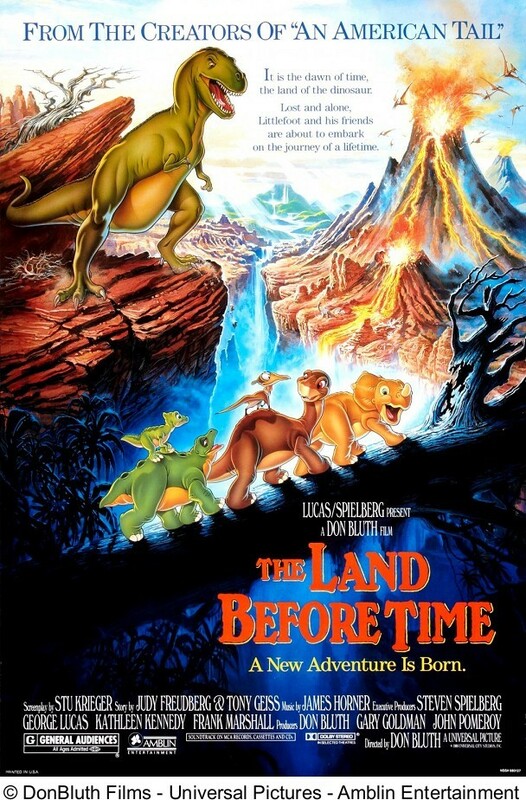 Gary Goldman: Well, firstly The Land BeforeTime didn't have wall-to-wall under-score, nor was it a ninety minute film. We originally planned for film to be 82 minutes in length, however, it endured several cuts or edits cutting the length down to around 73 minutes before we "spotted" the film for music with James and Steven (Spielberg). The film's final length was 69 minutes (the same length as Disney's Bambi). Regardless it was still a monumental undertaking. 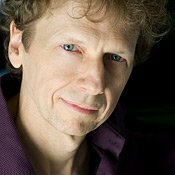 And, I do remember James commenting on his struggle to meet the recording date, plus give enough time for the copyists to prepare the orchestrations for the musicians in time for their performance. We had to go into additional sessions each evening to complete all of the music cues. James was exhausted before the recordings started – and even more exhausted after completion, but the score turned out absolutely beautiful. Do you have anecdotes about the recording sessions of both? Gary Goldman: There are a few. I remember when James, Barry and Cynthia met with all of us on An American Tail to present a couple of the songs for the film, Somewhere Out There and There Are No Cats in America. They started with Somewhere Out There, as this song's melody was going to be key to the score and hopefully be a mainstream song for commercial radio play. James started to play the melody on the piano beautifully, with a lot of flare and complex multiple notes. Then, Barry interrupted and said, "Let's keep it simple…" Leaning over James' shoulder he said, "…sort of like this. ", then with his index finger played the first five notes of the melody one note at a time. The moment reminded us of Antonio Salieri's critical comment about Mozart's music in the film Amadeus: "Too many notes". Everyone had a good laugh, including James. James took over and Cynthia sang the song. The song won everyone's praise, and Steven commented that he thought it will be a hit song – and it was! 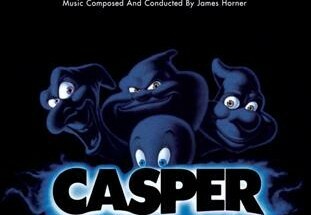 James used that song's melody throughout the film. When we arrived at Abbey Road on the day of recording, Don and I decided to sit in with the orchestra, instead of observing from the control booth. We sat behind the two harpists. Strange, what the musicians talk about. You would think that they would be thinking in terms of in their musicianship and discussing their performance and the magic of James' score. However, during the moments between rehearsals they talked about remodeling their bathrooms and kitchens, and the difficulties they were having with their building contractors. Perhaps their daily occupation as studio musicians was just a job…not a passion. At one point the two harpists turned back to us and asked Don to sign their copies of a harp book that Don's uncle had written years ago and Don had illustrated when he was just 16 years old. Don had forgotten all about illustrating it. It was a nice surprise. On The Land Before Time, as one of the producers, I think I was in constant panic because of the short schedule for James to write and for the copyist to complete their work on the sheet music for the musicians, plus the unscheduled overtime sessions. All I could think about was that we would go over budget on the score. Finally, the president of Universal's MCA music company patted me on the back and said, "Gary, don't worry about the added costs, MCA will cover it." From that moment on, I just relaxed and enjoyed James' creativity and attention to detail and perfection of the orchestra's performance. Why did your collaboration end after The Land Before Time? Did you try to work with him again on later projects? Gary Goldman: We had a two-picture deal with Universal and Steven Spielberg. There were a couple of conflicts regarding scoring our next films. 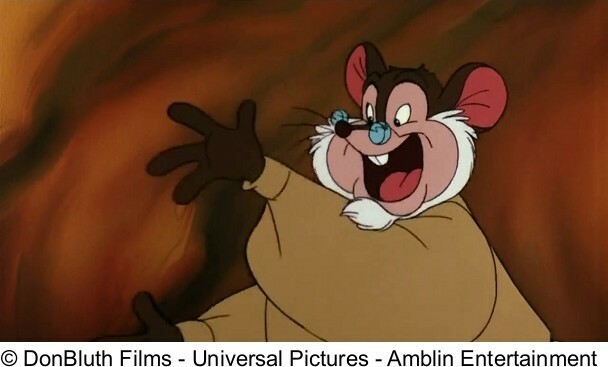 James became more in demand and complications with the Universal/Amblin negotiations regarding the budget for An American Tail 2: Fievel Goes West and we ended up not doing it. James did the score for the film. Our next few films had timing issues. James' schedule conflicted with our scoring schedules which prevented us from having James write music for us. What have you learnt from your collaboration with James Horner on An American Tail and The Land Before Time? Don Bluth: James is an accomplished, sensitive composer and I have learned that he will work tirelessly to deliver the very best musical score possible. On The Land Before Time he was exhausted, but was always ready to go into the night, if necessary, to get the best from the orchestra and chorales. You can count on him to deliver. Have you paid attention to his projects afterwards? What do you think of the evolution of his career/music? Don Bluth: I have not followed his career, but I'm aware of many of his scores from seeing the films either in the theater or on Academy screeners that we receive each year for Academy Award nominations and voting purposes. He just keeps getting better. Do you think that James Horner has brought something to animation scores, something different from the Disney scores? Gary Goldman: Definitely! James has a quality that many have suggested is similar to Jerry Goldsmith. James' approach is serious, with the concept of a sweeping epic score. At the same time, paying attention to the small details such as entertaining musical effects for the characters' walks and runs, and creating individual music themes for each character. Some of that is standard in animated films, but James does it with a style that wouldn't be considered Mickey Mouse music. What do you think of today's animated movies? Don Bluth: Sort of a mixed bag for me. It's all about story. If the story doesn't grab me, I don't really care. Also, I'm not a great fan of CG animation as the characters feel more like a puppets and stop-motion animation. 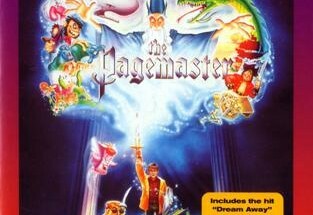 I miss the classic hand-drawn feature films. Though, several of Pixar's animated films have been very well executed. The ones I've been impressed with are Finding Nemo, Monsters Inc., the first 40 minutes of Wall-E, The Incredibles and Ratatouille. Oh, and Disney's Tangled. However, I'd just like to shine the light again on hand-drawn animation. Many thanks to this talented duo for their availability and the time they willingly devoted to answering our questions.